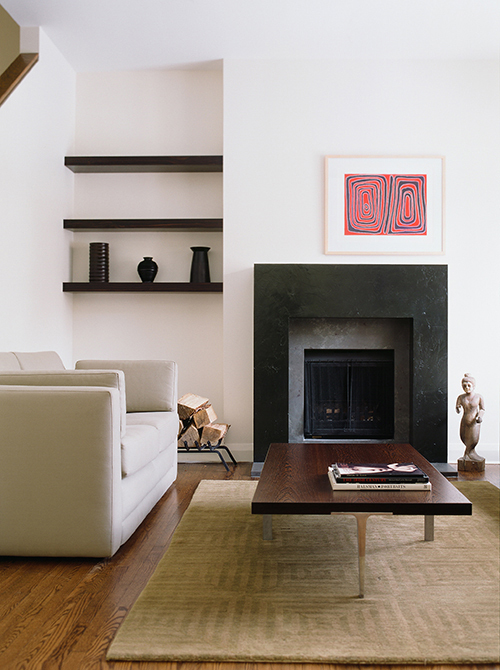 This home was owned by a bachelor entrepreneur who collected art from his many travels. The Edwardian house was built in the 1930's, gutted in the 1970's, and purchased 35 years later by my client. As there were no remaining original features in the house and since our client was young and urbane, we suggested a modern, clean, contemporary approach. The outmoded brass fireplace surround was replaced with slate, and a new lacquered mantel was designed to create a graphic focus for the room. Existing white plastic shelves were replaced with clean floating shelves in exotic wood, and higher contemporary baseboards were added to replace the poorly proportioned existing ones. To maximize the budget, we reupholstered the client's sofas, and designed a beautiful custom cabinet in zebra wood to compliment and contrast with the white sofas. The client's art and object collections from around the world fit in perfectly in this new clean space. This home has inspired many of our clients to call us, as it appeals to those wanting a calm, modern, airy refuge from their busy lives. The elements that make this space work are the mix of warm woods, the neutral backdrop and the careful editing and placement of the art. The client, now married with two children, has since contacted us to begin work on a larger contemporary renovation.